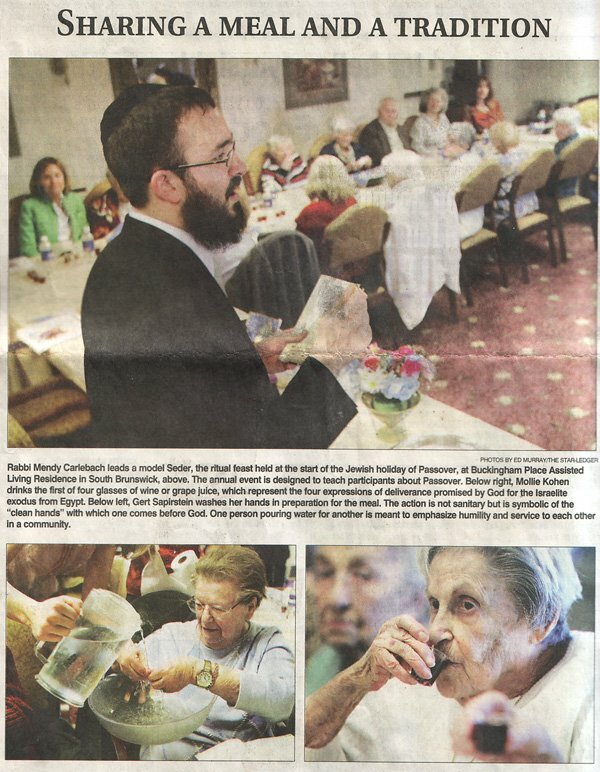 Rabbi Mendy Carlebach leads a model Seder, the ritual feast held at the start of the Jewish holiday of Passover, at Buckingham Place Assisted Living Residence in South Brunswick, above. The annual event is designed to teach participants about Passover. Below right, Mollie Kohen drinks the first of four glasses of wine or grape juice, which represent the four expressions of deliverance promised by God for the Israelite exodus from Egypt Below left , Gert Sapirstein washes her hands in preparation for the meal. The action is not sanitary but is symbolic of the "clean hands" with which one comes before God. One person pouring water for another is meant to emphasize humility and service to each other in a community.